John Scarborough - A sterling season from Scarbs. A tower of strength at the back and a worrying presence in the opponent's box as well. Scoobie managed to bag 6 goals this season and they weren't all scored with his shin. Alan Bray - A breakthrough season for the youngster, who took his opportunity of first team football well and never looked back. Bray also grabbed important goals versus Corinthian Casuals and Bognor Regis Town and even managed to finish the season between the sticks. Away v Bognor Regis Town - An awesome performance that saw the introduction of Craig Tanner and Warren McBean. Charlie Ide managed a pair in his final game in the amber and chocolate stripes, whilst the debutant McBean and acrobatic John Scarborough also netted for the U's. Ross Gaynor, Away v Dorchester Town - It was the set piece corner routine. The ball was dummied on the edge of the box by Tony Quinton and then unceremoniously crashed into the top corner from about 25 yards by Gaynor. Tony Quinton, Home v Hayes - After firing in the only goal of the game TQ led several U's players in the Aylesbury duck celebration. The Boro Bug, Farnborough Town - It might not be the best looking mascot, but the free sweets that it hands out more than make up for that. The Iron Burger, Braintree Town - Thurrock's 'Fleet burger (pictured) lost it's crown to the new-comer. An awesome combination of burger, bacon, sausage and fried onions on the first day of the season set the standard to be beaten. Ironically it wouldn't be until the last day of the season until the fare at Thurrock would be sampled, but the Iron burger stood defiant. Eastbourne Borough's Keeper Shirt - It's pink. Do we need to say any more. Lewes' New Stand - We're pretty sure the local Shell petrol station might be missing its roof. Richard Harris - There could only be one winner. Away v Cambridge City - As injuries take their toll on the squad Paul Harford makes the subs bench on the team sheet. Unfortunately Paul wasn't brought on. The Referees in charge of Sutton v Newport and Thurrock v Sutton - This award was jointly given to the men in charge of Sutton's last two league fixtures, for 1. pulling decisions that spoilt the games out of thin air, and 2. ruining the end of an otherwise enjoyable season. Surrey Police - For pulling over the speeding idiot, in the swish black estate car, who was so engaged in his mobile phone conversation that he managed to pass a huge Police 4x4 that was in the inside lane. 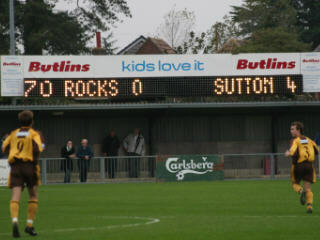 Needless to say this cheered us up a bit after the loss to Thurrock only 45 minutes earlier. A Decent Cup Run - Ok so the U's may have had a great spell in the FA competitions back in late 80's early 90's but right now a run in either the F.A. Cup or F.A. Trophy is already at the top of f-t-l's Christmas wish list. evidence as well. You never know if we like it and if it's not too offensive we might include it.